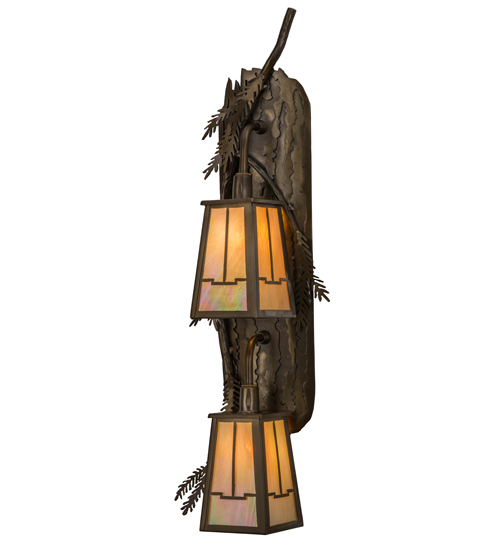 Description: Enjoy the natural beauty of the American woodlands with this stunning two-light wall luminaire. Designed with steel Pine tree branches with Pine needles, the hardware is featured in an Antique Copper finish. Two stunning Arts & Crafts styled lanterns feature Beige Iridescent art glass with an abstract view of the valley design. Handcrafted by Meyda artisans at the foothills of the Adirondack Mountains, this sconce is available in custom sizes, styles, colors and dimmable energy efficient lamping.